Check this out folks! Before: crooked as a dog’s hind leg. After: straight as an arrow! Woop Woop! 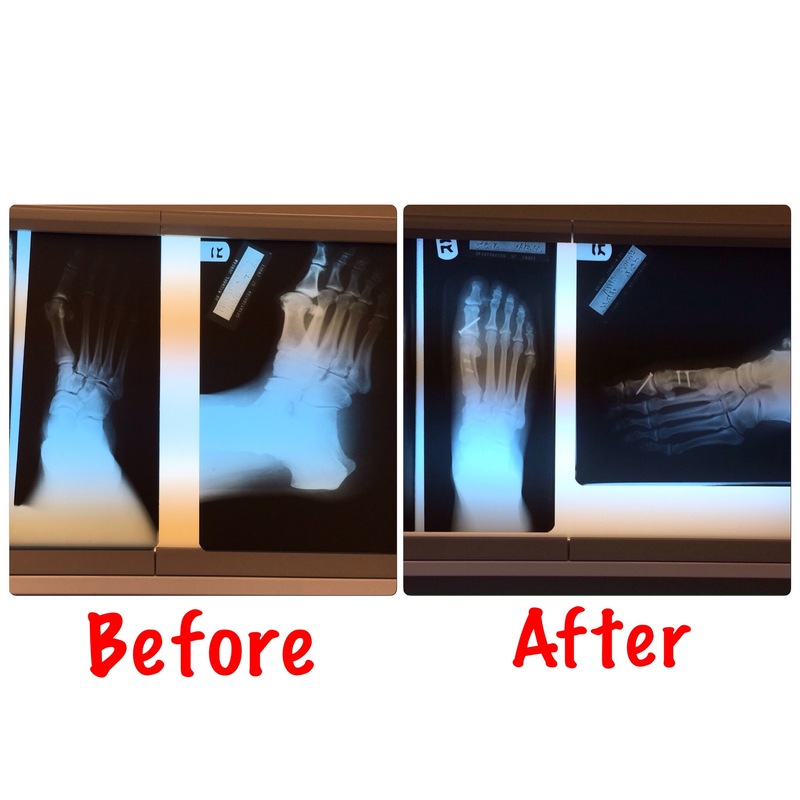 I am now in day 10 of my recovery from a bunionectomy. No bad so far. I’m walking and getting around, but still need to get the old foot up and iced when I’ve done too much. I still can’t drive since I’m still wearin that big ol boot. Thomas just went to work flipping burgers and Superman and Sam went to the farm…without me.🙁 So lucky for you, I’ve got another blog post: “How I Have Kept Myself From Going CooCoo”. 1. Prepare beforehand. 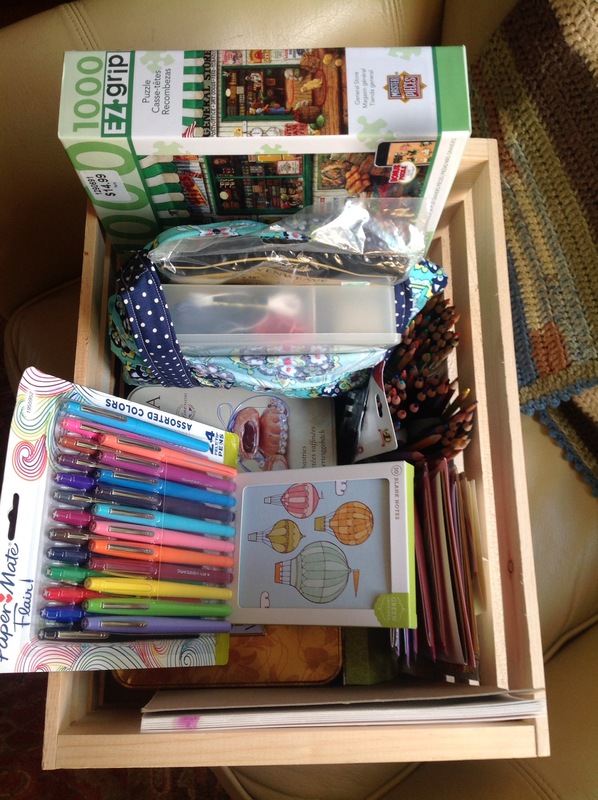 Before the surgery, I packed a wooden crate full of things I thought I might like to do to bide my time. This was crucial in the fact, that if I had asked one of my guys to find something in my craftroom or anywhere else in the house, a week later they’d still be looking. 2. Write notes and handwritten letters. As you see in the picture above, I bought note cards, stationery and stamps to write thank you notes for all the sweet friends bringing dinner, visiting, sending flowers and giving me a call. 3. Create Cards. One day Dagmar shows up to door bearing a beautiful box filled with card making supplies. Oh my goodness! 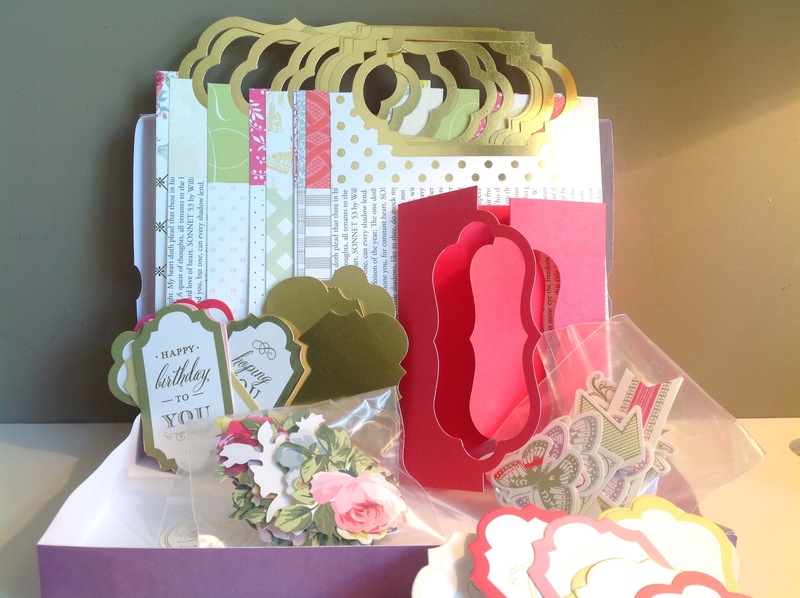 All I needed was a little glue, because everything was included: the flip card, sentiments and decorations. I spent hours creating cards for people then immediately writing a small note inside, addressing them, then popping them in the mailbox. THis is one that I made. Isn’t it pretty? 4. Spend some time with God. 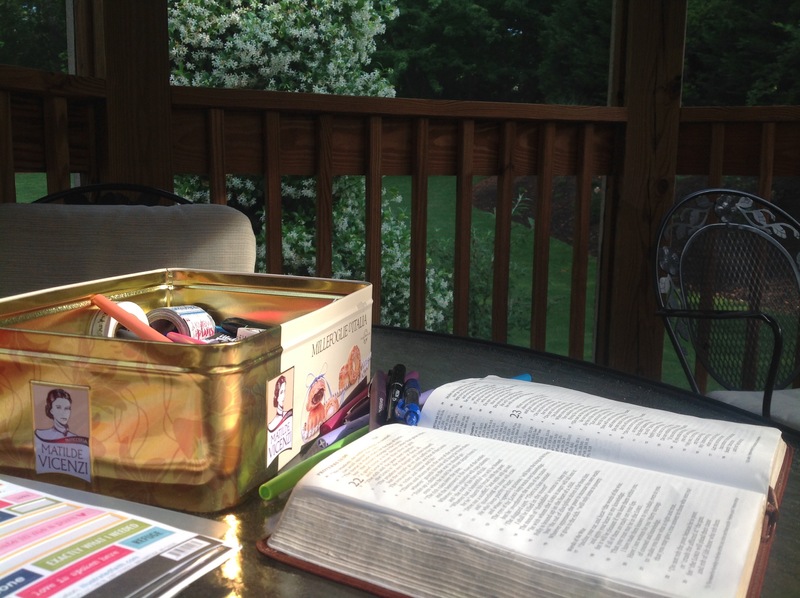 As I could walk more, I sat outside in the gazebo to spend time with God. I read the bible, wrote scripture..
5. Get outside. Even if only for short snippets of time.Fresh air and sunshine does the body good. I hobbled over to check on the garden. Looks like it’s going to be a full summer of fruits and vegetables…peas, beans, okra, peppers, cucumbers, tomatoes, and watermelon. I even took the time to just breathe. We have a real comfy canvas swing out back. 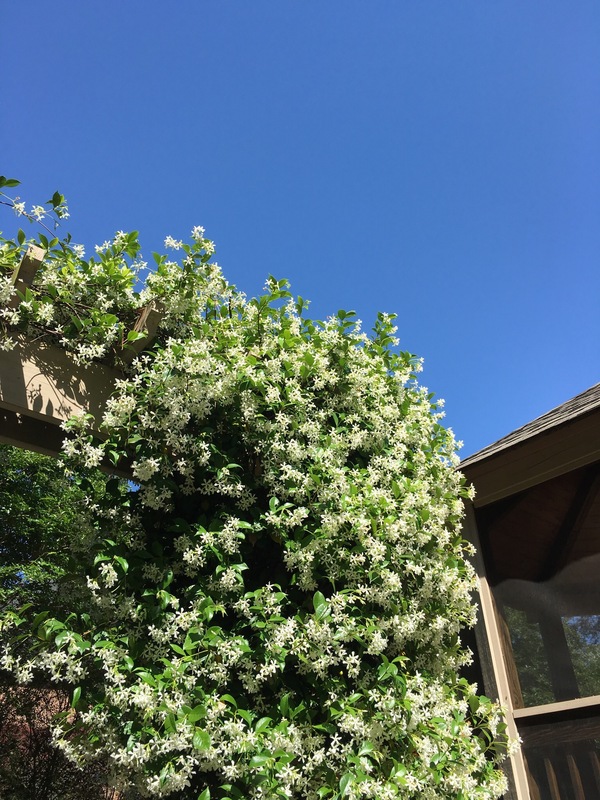 I sat back, smelled the sweet jasmine, marveled at the clear blue sky, felt the sun on my skin and listened to the birds sing praises. Ahhh…. 6. Do a puzzle. Puzzles are great for the mind. I put on some Dave Barnes Pandora Radio, opened the windows and spent many hours putting this 1000 piece bad boy together. Having my foot hanging down for too long requires some icing, but it’s good to see a different set of walls. 7. Learn Something New. Yes, I’ve done embroidery, sort of. I decided to try big girl embroidery, with my own drawing and with shading. You can’t really see the pencil marks where I drew this flower, (which is good, because we don’t want random pencil marks peeping through.) But hopefully when I finish, it’ll be something kinda cool. 8. Organize. My jewelry has been driving me crazy for a while now. I saved this dreaded task for when I knew I’d have the time, like now. Almost all of it is cr*p. It’s stuff I’ve tried to make and haven’t liked, so it sits in the drawer taking up space. Sweet Lilly wanted to pick something out to match her beautiful outfit. Like all princesses, she picked pearls. 9. Let go and binge watch a series or two….or three. Oh Lordy, save my soul. Is it a sin to get giddy over the vicar of Grantchester? No offense to all the men of the cloth, but I ain’t neva seen a clergyman with a set of abs like his. Sydney Chambers, played by James Norton, reminds me of a young Robert Redford. The picture above does not do him justice, just sayin. Any Hoo…a Cambridgeshire clergyman finds himself investigating a series of mysterious wrongdoings in his small village of Grantchester. I have to truly make myself do or watch something else, just so I can save the next episode. I’m afraid I’d watch them all without stopping! Grantchester can be seen on PBS. The next two shows are on this whole, Old English village/BBC genre I’ve been watching lately. A while back, I was into dark murder and suspence shows, like Hinderland, Wallender and Broadchurch. Now it’s all about the old English characters and their wonderful costumes.What’s cool about watching these British series is how you start seeing the same actors in different shows. For example, in Cranford, Captain Brown is played by Jim Carter, which you know was Mr. Carson in Downton Abbey. 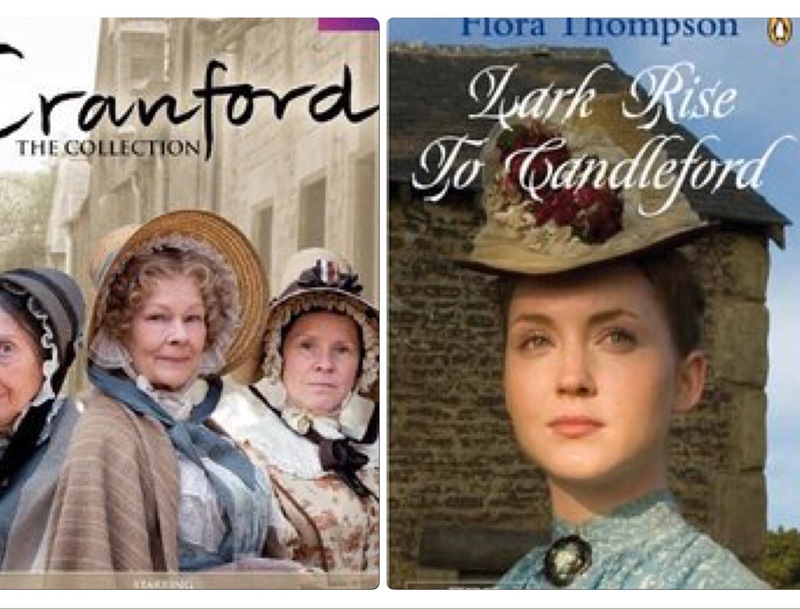 Also in Cranford is “Martha, the servant”, who is acted by Claudie Blakey who also played “Agatha” in Grantchester and “Emma” in Lark Rise to Candleford! There’s also Brendan Coyle, who you may know as John Bates in Downton Abbey or as Robert Timmons in Lark Rise in Candleford. I love it! My last British obsession, The Great British Sewing Bee. This follows much like The Great British Baking Show that I have talked about before. The people are just every day Joes and Julie’s who love to bake and sew. 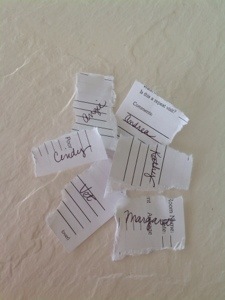 The contestants and judges are all nice and quite talented. The amateur sewers take on challenges like sewing an invisible zipper and smooth darts. Quite exciting I must say. My guys look at me as if I have two heads when I tell them how excited I am to see who is going to have to rip their seams open or have their buttonholes all wonkadoodle. I LOVE IT! Have you seen this hilarious Netflix original? 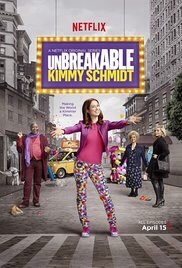 Tina Fey is the creator/writer of this funny show in which Kimmy Schmidt, played by Ellie Kemper, who was also on The Office as Erin, is a woman who is rescued from a doomsday cult and starts life over again in New York City. It’s a silly, fun, very over the top, laugh out loud 30 minute escape. Brooklyn….An Irish immigrant lands in 1950s Brooklyn, where she quickly falls into a romance with a local. When her past catches up with her, however, she must choose between two countries and the lives that exist within. I’ve seen it twice and will probably see it many times more. So there you have it folks, my Top 9 Things to do When Forced to be Off Your Feet for a Week. I’ve got a snazzy new blue wrap, a straight toe, wonderful friends who keep an eye on me and another episode of Sydney Chambers the vicar to watch! 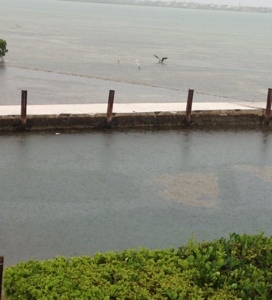 It’s a rainy day here in the Keys. Love It! We have been getting up at 5:30 am almost every day this week in order to get to some boat that will take us snorkeling or fishing. So today’s rain is wonderful! I’m sitting here on the back porch watching the birds and enjoying some peace and quiet. 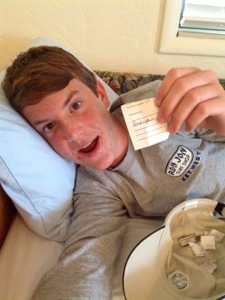 As I play around on my IPad I remember that I had my very first giveaway! Well HELLO! Have I picked a winner? Heck Fire! I rush to my “office” and put in all the data. 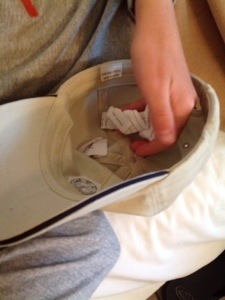 Have the highly qualified accounting firm of T.D.Higgins and Associates calculate the winner…. Andrea!!! You are the BiG winner of a year’s subscription to Life:Beautiful Magazine! Go here to read more about one of my favorite magazines. Keep a look out for more giveaways. When I find some goodies that I think you have to have I’ll pass them along.